Energize your workouts with the Nautilus E618 Elliptical Trainer Machine MY18 2018 from the Nautilus Performance Series range. 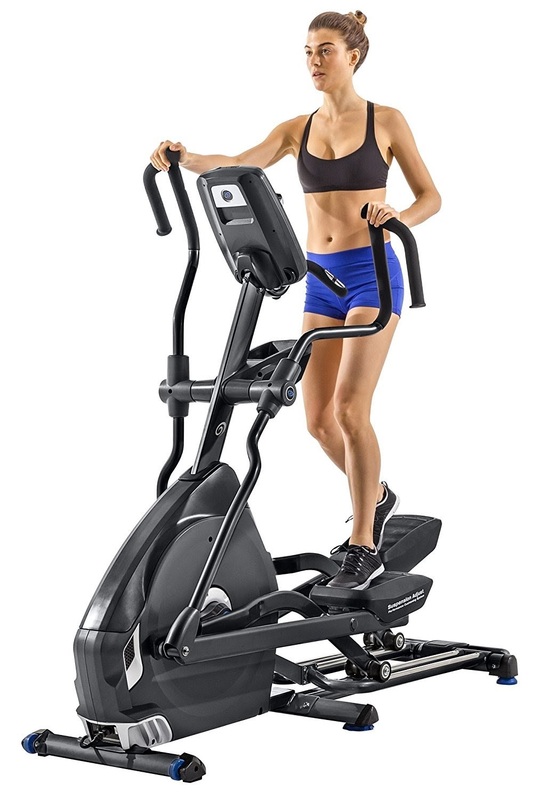 Designed for serious athletes looking to perform intensive workouts in the comfort of their own home, the Nautilus E618 Elliptical Trainer MY18 combines ergonomic comforts with a high build quality and a wealth of premium features to keep your workouts varied and progressively challenging. The Nautilus E618 Elliptical Trainer 2018 incorporates the same high-end features as the previous 2016 model but is finished in an all-black color for a sleeker-look compared to the grey/silver color of the previous model. With its 30 lb high-speed high-inertia perimeter-weighted flywheel and Eddy Current Brake magnetic resistance system, the Nautilus E618 Elliptical Trainer MY18’s drive train is optimized for high performance and ensures smooth, quiet and consistent momentum throughout the wide range of 29 programs and 25 resistance levels. The Nautilus E618 Elliptical Trainer MY18 2018 is ergonomically designed with a 22” stride length and a Suspension Adjust Performance Cushioning System that allows you to adjust the angle of the footplate from 0 to 10 degrees for customized heel support. The Nautilus E618’s dual rail system effectively distributes each stride load which helps to increase the overall balance, stability and smoothness of your workout. In addition to the Nautilus E618’s varied programs and resistance levels, this elliptical trainer also features a motorized adjustable incline range from 0 to 15 degrees for added challenge and to work more muscle groups. For convenience, the speed and incline range on the Nautilus E618 can quickly and easily be adjusted via the Quick Touch buttons built into the E618’s multi-grip-position moving handlebars. The Nautilus E618 Elliptical Trainer MY18 2018 comes with a premium SightLine console that is tilt-adjustable for the best viewing angle for different users. The console’s Dual Track STN blue backlit LCD display (2 windows) is easy on the eyes and displays motivating workout stats including time, speed, distance, calories and heart-rate. To help you stay within your target heart-rate zone as you exercise, the Nautilus E618 offers both contact pulse grip and telemetry heart-rate monitoring (chest strap included). The E618’s 29 performance training programs are varied and motivating and include pre-set workouts for intervals, challenges, weight management, heart-rate programs as well as customizable training options. 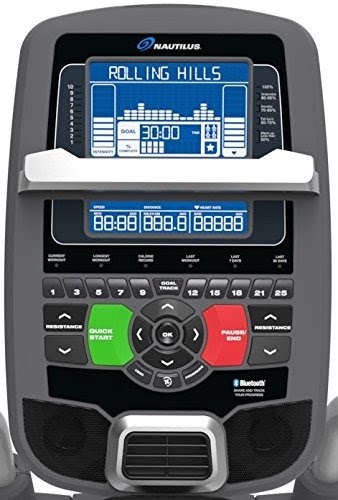 The Nautilus E618 Elliptical Machine 2018 allows for 4 different user profiles and the console is also Bluetooth enabled for seamless transferring of your workout data to online fitness tracking apps on your own mobile phone/tablet, including the free Nautilus Trainer / Nautilus Connect app and other partnered fitness apps. Additional premium features incorporated into the Nautilus E618’s console include a 3-speed cooling fan, in-console speakers with MP3 input, USB charging port, and a built-in media shelf. There’s also a convenient water bottle holder located on the frame underneath the console so you can keep hydrated as you exercise. Allowing for an extended user weight capacity of up to 350 lbs, the Nautilus E618 Elliptical Trainer Machine MY18 2018 is sturdily constructed and features stabilizer frame levelers for added stability. It also comes with front-mounted transport wheels for easy relocation. The Nautilus E618 Elliptical Trainer 2018 is built to challenge the serious athlete looking to train and achieve at a higher level in the comfort of their own home. It’s built to withstand high intensity interval training, combining performance training programs with comfort ergonomics to help you achieve and maintain your fitness goals. Stand-out features that make the Nautilus E618 Elliptical Trainer worth every penny and not typically found on elliptical machines at this price point include its dual-rail system, adjustable suspension cushioning system, motorized incline, and tilting SightLine console. Elliptical Trainers in general offer a very effective cardio and total-body low-impact workout that’s easier on your joints compared to many other types of exercise.